The gold-stock fund (NYSE: GDX) has fallen 35% from its September high. But note the recent action in the 18-month chart below. 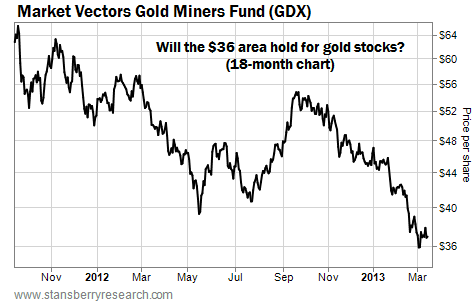 GDX has found a "toehold" in the $36 per share area. This is an important level. Should this toehold turn into a foothold, the gold sector will use it as a foundation… and spring higher from it.